I always liked Tic Tacs when I was a little kid because I felt like I was taking “my pills” just like grandma. It sounds ridiculous but I guess it was better than actually going through my grandmother’s bag and actually taking her pills. 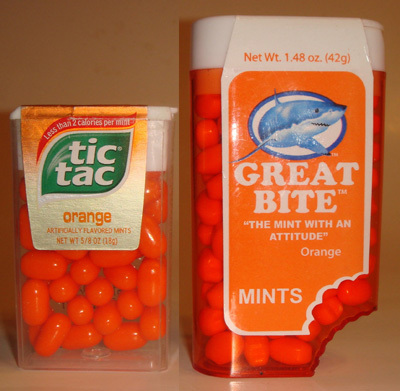 Aaaaanyway, I saw these Great Bite mints and while they came in a few flavors, i picked orange because that’s the only flavor of Tic Tac I’d ever get. I always thought it was very considerate of Tic Tac to offer a non-mint option for those of us who weren’t up for that type of flavor. These are perfect little ovals that used to boast being “One and a half calories” but they’re not 1.9 calories, not that it realy matter but I wondered what happened there. Ethan and I noticed that it takes a little bit of rolling these around in the mouth to get to the orange flavor. At first I thought I got a dud but then the orange flavor revealed itself and it had a pleasantly strong flavor. Ethan liked how when he got to the point of biting down it was a little soft and broke up nicely. I agreed. These guys have a cute little bite taken out of each piece. They are similar to Tic Tacs in the way that we didn’t taste the flavor immediately. Ethan thought the flavor was like orange sherbet. It tasted pretty much the same as Tic Tac but the center was harder when bitten down on and tasted like a sweet tart. Ethan liked the Tic Tacs better and I felt like they were too similar to really care. I did notice Great Bite tasting like a sweet tart but I didn’t mind it and I didn’t miss it either if I was eating the Tic Tac. So really I think both of these server their purpose well but Ethan will stand by the Tic Tacs. Tic Tac or Great Bite? 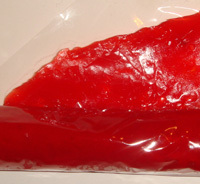 I think everyone has had a fruit roll-up in the lunch bag at school. They’re convenient, tasty and something that needs to be ripped apart so they’re perfect for kids. My only issue with these are how terribly they stick to my teeth, making them so enjoyable I stopped eating these many years ago. These were very smooth in texture and had a slightly plastic feel. The strawberry smell was very strong. The taste was a little too sweet and had an artificial quality to it, but still fruity. Ethan said he was afraid to bite down, I was too so I just kind of rubbed it against the roof of my mouth with my tongue until it dissolved. I feel like we should have tried the Fruit Roll first because it just didn’t taste too good. We spit out our pieces before we were done eating them. Later I found out that dried apricots are the main ingredient which explains the rough texture and less strawberry taste that Fruit Roll-up had. 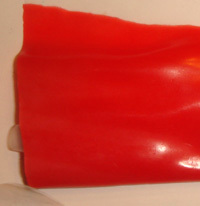 Although I do remember the original texture of Fruit Roll-ups being more like this years ago. There is still corn syrup and sugar in these but I think it’s the apricot base that really disrupted the strawberry flavor. Fruit Roll-up or Fruit Roll? I’ve never had a Lunchable before. The concept is okay but still, to buy something like this on a regular basis seems kind of needless when it’s so easy to put something like this together on your own. But I guess they have a market because they seem to be very sucessful. 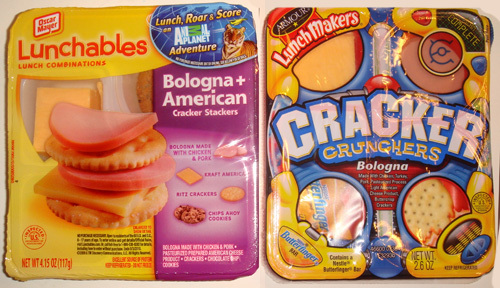 I found both Lunchable and LunchMaker varieties featuring bologna and American cheese. I almost picked the turkey but remembered Ethan doesn’t like turkey and the way the meat sliced looked had everything I hate about cold cuts- the multi-colored pieces with a clear ribbon of gel that keeps the mismatching pieces of meat together. Not that bologna is any less gross in that respect, but I do appreciate the uni-colored mass that has been pureed to the point that it’s just one texture. 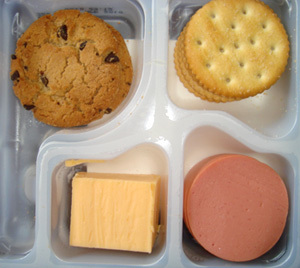 Lunchables have the big name of Oscar Mayer so they boast name-brand items like Ritz crackers and Chips Ahoy cookies. We noticed that the slices of bologna were extremely thick (as far as cold cuts go) and that added to it’s rubbery texture. Plus it had a weird taste to it, at first I thought it was peppery but then I really couldn’t figure it out. The Ritz crackers were surprisingly non-Ritz like. 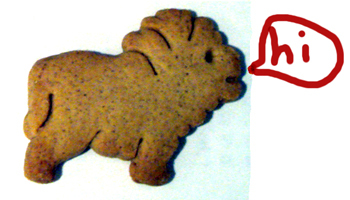 Ethan described them as having McDonald’s cookie taste/consistency. These must be made especially for Lunchables and they cleary use a different recipe. The cheese was the most processed tasting cheese I’ve ever experienced. With very little flavor, it seems to be added just for filler. The cookies tasted like the standard boxed cookies- not disappointing in that way. We liked that the bologna slices were much thinner and tasted better. There was no weird flavor and I guess you might saw we appreciated that in comparison to Lunchables. I thought the cheese tasted better, it actually tasted like cheese. The crackers were okay, they did their job as being a vehicle for the bologna and cheese. Ethan ate the Butterfinger which he reported tasted like a normal Butterfinger. Wrap up: We weren’t really crazy about either, but sided with Armour’s LunchMakers because of the thinness of the slices and the all-around slightly better taste. Ethan even said it tasted more “natural” in comparison to Lunchables. 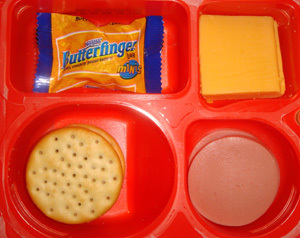 We expected more from Lunchables because this meal/snack format was their idea and they had the “Ritz” crackers. 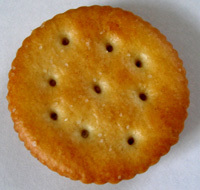 The disappointment of the second-rate version of Ritz’s own product was a big demerit. Plus being a leader in the cold cut industry I expected better taste and normal slice thickness from Oscar Mayer. Frosted Flakes were always a treat when I was a kid. my sisters and I were only allowed sugar cereal only on certain occasions like birthdays and camping (my parents would get the variety pack of little cereal boxes). 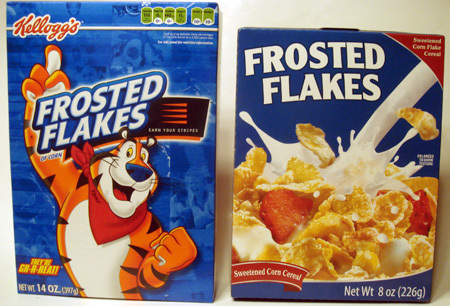 I was in the dollar store and found another Frosted Flakes and was baffled by the lack of brand. It’s like no one makes it. The only thing it said is who it’s distributed by and that it’s a product of Argentina. The front and back of the box are exactly the same too. 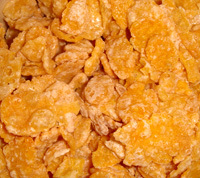 Kellogg’s are nice big flakes that look appealing (as far as flaked cereal goes). Ethan and I agreed these provided a nice, satisfying crunch. The sweetness was just right even though it looks like there is a lot of frosting. There wasn’t too much to much to say about these but it was because they delivered so well. The first thing we noticed were how much smaller the flakes were. A slightly different hue but visually seemed to have just as much frosting. We both found these flakes to be harder and more dense. Also, with all that frosting we were surprised they really weren’t that sweet and there was nothing to mask the slight cigarettey aftertaste that made me wonder what the factory working conditions were like. You’d think “how can you really screw up frosted flakes?” but they seem to have figured out how at this nameless cereal factory in Argentina. Maybe our first hint should have been that there was no cartoon mascot on the front (as every proper kids’ cereal should have). 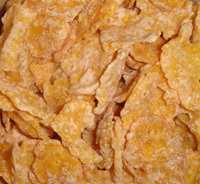 No name didn’t have the light crispy crunch that Kellog’s had. 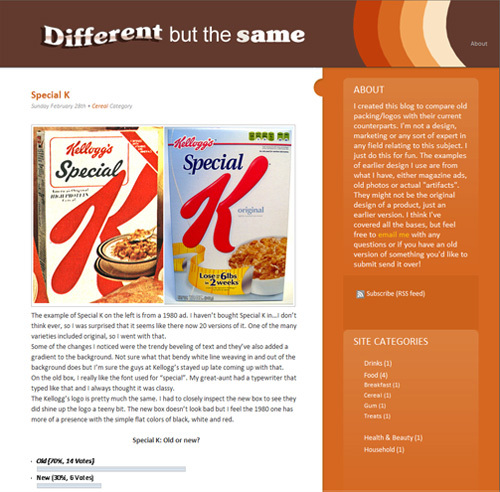 That, plus the lack of sweetness and cigarette aftertaste just..didn’t cut it and left Kellogg’s the preferred FF. Peanut butter crackers are a pretty good idea, a little carb, a little protein, sugar, salt and -voila, snack. Not the best snack in the world. I’ve only had these out of desperation at the vending machine but they do seem to do the trick. Come to think of it, I should keep, a packet of these in my glove box. That packet of ketchup that’s in there now probably won’t do much for me if I were stranded. These smell more peanut buttery than they taste. 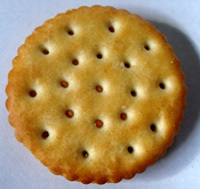 The crackers are really good, they have just the right amount of salt and they have that reliable Ritz buttery taste. In fact, I didn’t really taste the peanut butter that much but we both found these enjoyable as the crackers are so good. Very bland crackers with no salt. I really felt like I was eating a hardened water and flour combination with something in the middle that wasn’t necessarily peanut butter. We both ate another Ritz after these to end the evaluation on a better note. These are probably okay if there’s nothing else around and they’re not being compared to a more flavorful cracker, but they’re definitely not our first choice if we bought something like these again. 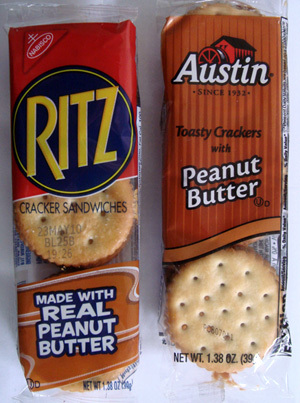 Ritz, even though the peanut butter wasn’t very pronounced. They do what they do so well that they crackers make up for the lack of pb flavor. Austin’s crackers were bland enough to not make them worth eating- although like I said, it might be because we were eating them right after the Cadillac of crackers. I thought I’d have a triple header here but Chef Boy-ar-dee only makes spaghetti with meatballs. We found this British Heinz spaghetti in a store in Vermont (where you can still buy “Gee Your hair Smells Terrific“) but I’m guessing it should be in most import sections of your local grocery store- maybe not, I don’t know. As I mentioned in my previous post, Franco-American was bought out by the almighty Campbell’s mega-corp, although the only product that they still allow to carry the Franco-American label is their slow roast gravy. 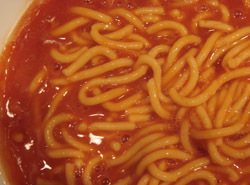 You’d think they’d keep F-A associated with their pasta products like Spaghettio’s but…no. So what you’re looking at here is the most mushy pasta you will ever eat. Perfect for accommodating those who just got their wisdom teeth out, it’s like a micro-molecule away from having the consistency of pudding. The pasta (besides from being mushy) had a very starchy taste. The sauce was not very tomatoey and Ethan noticed there was a slight tin taste from the can. Also the sauce was sweet. Not much to care for with this product. It’s funny when you think something is terrible and then you taste something that is even worse. We actually preferred Campbell’s over Heinz. 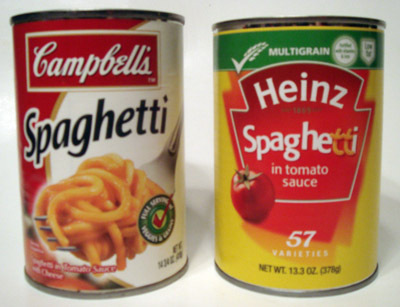 There was just something so lacking in Heinz that made it hard to eat and not dip the fork back into the Campbell’s bowl. 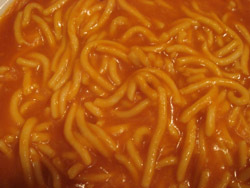 Mushy, startchy, tinny tasting spaghetti with cheese is better than slightly firmer spaghetti with bland sauce. 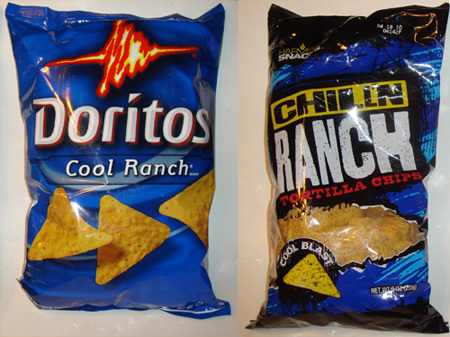 I both remember and forget when Cool Ranch Doritos came out. 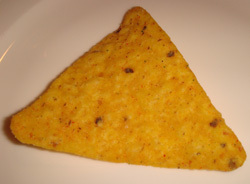 Sometime when I was in Middle School, I think (I forget), and I remember thinking Nacho Cheese is so perfectly awesome, why create another flavor? But I have to say they won me over even though I’m not a big corn chip person. I can’t stand Fritos or things like that but there was something about Nacho Cheese and then Cool Ranch that made corn chips so enjoyable. 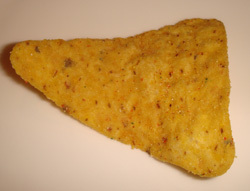 Although honestly, the last time I had a Dorito of any kind was in September of ’08 so I’m still not a die-hard fan but I guess I’m due for some corn chip evaluation. They don’t look to exciting but the taste was totally what I remembered it being like from past experiences. Flavorful with a slight tang that made it so “ranchy”. It’s interesting that there really isn’t a creaminess quality but they still somehow capture the essence of “ranch” so well. Ethan they make his “taste buds tingle.” The only thing Ethan said was kind of a minus was that the corn chip itself didn’t taste as good as Nacho Cheese Doritos. He couldn’t tell if it was the chip or that the ranch flavor overpowered the flavor of the chip. These looked pretty much the same, even had the specks of red in the flavor powder that Doritos had but the taste was off. We couldn’t put our finger on it but there was something missing and added that made it taste weird. The only thing that came to mind was “chemically tasting”. One thing I felt might have also made a difference was the chip tasted like it was too toasty even though it didn’t look burnt, it had that overpowering toastiness. It seemed that the Cool Ranch flavor over powered the chip while the Chillin’ Ranch toastiness of the chip kind monstrously harmonised with the chemical taste of the ranch flavoring. We both agreed Doritos was a better chip because of the flavor being so good and because of that it wasn’t a big loss not to be able to taste the chip. Ethan and I both had to eat a couple of Doritios to get the Chillin’ Ranch taste out of our mouths. Cool Ranch or Chillin' Ranch? 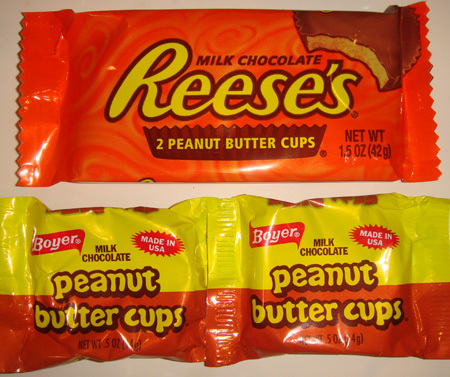 I had only seen the Palmer version of peanut butter cups so when I found these Boyer (who I’ve only experienced their Mallow Cups) I thought this would, at the very least, be an excuse to eat a Reese’s even if Boyer was a let down. The usual awesomeness. Perfectly balanced chocolate with smooth creamy (and not too sweet) peanut butter. There is just something that is so reliably good about these. As soon we bit into these we could tell they’re weren’t up to speed. Ethan was disgusted by the chocolate. I didn’t mind the chocolate as much as the peanut butter which seemed to be mostly “filler” of some sort, I have no idea but it was a very weak PB flavor and felt like I was eating crisco or something. Sometimes smaller brands are better but not in this case. We both couldn’t get over our issues with the Boyer cups. I wish I could support the little guy in this one but there’s really nothing like a Reese’s.